I’ll get straight to the point. Khalil Mamoon that are made in China are FAKE – like the KM’s sold on eBay and Amazon are most likely fake! All authentic KM Hookahs are hand crafted in Cairo, Egypt and produced individually. These products are handmade in a traditional manner and are not produced off of an assembly line or mass assembly. Since the Khalil Mamoon hookahs are handmade, they usually have slight variations from hookah to hookah. Weld marks, minor scuffs and scratched on the stem or other marks which may occur from bending the metal such as on the top of the hose port is normal. 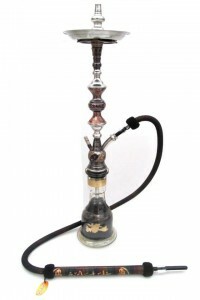 Some hookahs contain visible weld lines or unpolished metal at the welds and Glasses (Vase) are hand painted and may have slight variations from glass to glass. The Khalil Mamoon Original Hookah is the standard by which all hookahs are measured to stainless steel throughout the stem with brass rings and the original stamps of KM initials. This stamp is located on the top of the stem (where the tray sits) and also on the tray. (See picture above) The center design is simple Egyptian fare, and is the hookah of choice at many hookah bars throughout. The stem supports the stainless steel tray, while the hookah makes use of thick tubing and strong welds to provide the best in Egyptian quality.